datatoys Helmet Camera System UNIVERSAL - Dezod Motorsports Inc - Home of the automotive performance enthusiast since 2002. Datatoys camera kits are perfect for applications with pre-existing recorders; allowing you to add an external camera and microphone to your PVR, DVR or camcorder. Our small and light weight bullet cameras combine with our easy to use waterproof and positive locking cabling to create the ideal, helmet camera or external bullet camera system. Perfect for any motorsports or racing. The camera in this kit is the datatoys E380 camera. The E380 camera is a great camera for the price and with this kit is the only way that datatoys offers it. Included is one of our omni directional microphones for great sound to go with the video. This kit has everything but the recorder and the batteries to capture a base jump or a race in a go-kart. Be sure to look at our mount selection to fasten the camera properly to whatever you are intending to use. What makes this an upgrade from the Base Kit is that the camera in this kit is the datatoys E580 camera. The E580 or Sony 1/3” EXView HAD CCD 580 line bullet camera is the best on the market. Whether you are dog sled racing or bicycle racing, this kit has what you need to capture the footage. All you need is the recorder and batteries. Also included is one of our omni directional microphones for great sound to go with the video. Be sure to look at our mount selection to fasten the camera properly to whatever you are intending to use. 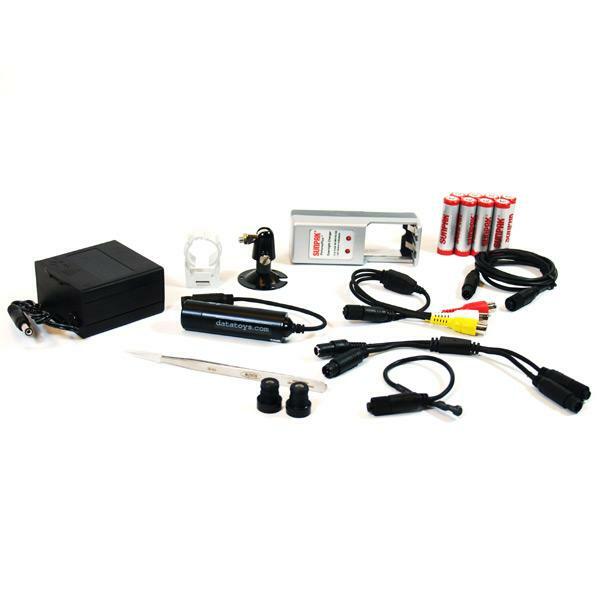 This kit has two extra camera lenses and a battery charger included along with the datatoys E580 camera. The E580 or Sony 1/3” EXView HAD CCD 580 line bullet camera is the best on the market. If you want interchangeable lenses, this is the kit for you (check lens page for sizes and field of view specs). Great for the adventurous person who partakes in many different extreme sports. This kit has 8-AA batteries to run the camera so all you need is the recorder and you are making videos. This kit has the omni directional microphones for great sound to go with the video and you have your choice of battery chargers. Be sure to look at our mount selection to fasten the camera properly to whatever you are intending to use.